My daughter and I went to FlightPath Coffee during Finals Week before Christmas. This young brainiac came in late with her friend, and snagged one of the best tables. I don’t know if she knew how lucky she was – probably not. These Einstein- types can be totally unaware of the world around them. She had on a huge TULANE pullover sweatshirt hoodie that absolutely swallowed her. She looked like some mad monk working on alchemical formulae. She was eating that code – her entire body was thrust into the act. Then, the caterpillar turned into a butterfly: she took off her hoodie, and the most beautiful, petite,long-necked young woman emerged. She relaxed. I suppose that she was in the groove, and had got over the difficult patch in her thinking. 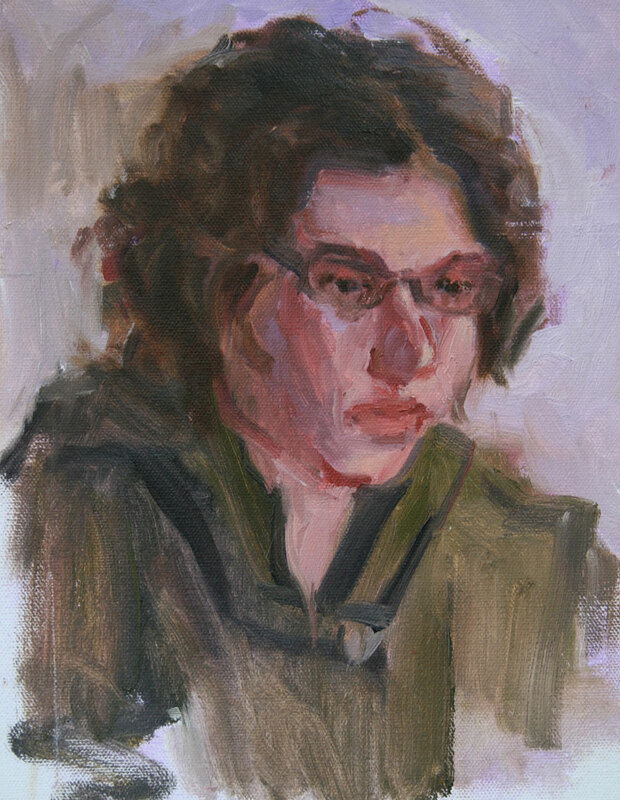 This entry was written by Lavanna Martin, posted on January 5, 2010 at 7:49 pm, filed under alla prima, art, guerrilla artist, guerrilla portraiture, Oil Sketches Live at Coffee Houses, painting live, portrait sketch, portraiture, sketches and tagged art, flightpath coffee, paint, painting. Bookmark the permalink. Follow any comments here with the RSS feed for this post. Post a comment or leave a trackback: Trackback URL. This one is…like a view in her heart. U had a good day?! I wish that I would have had the time to paint her after she relaxes, sans hoodie. Can´T translate. ” sans hoodie! !” Sans means “after” thats spanish or french, HELP ME! PLEASE! Sans, Latin derivative, meaning “without”. So, without hoodie, means she took the hoodie off, and she was actually a petite, pretty girl. ps:must get my German-speaking art student to translate your blog. I might be shocked, huh? Lovely painting, and I really like the description that accompanies it especially the part about the catepillar turning into a butterfly. Hope that you have a good year. Oh, sorry, I got it. A hoodie is when an Inuit makes a jacket from a bearfur! No, it´s not easy to shock me but you can ask me to translate! Could improve my english! Your paintings are very nice! I especially like this one, maybe because it reminds me of when I do research. I checked out your new blog. Looking forward to seeing what you have to say – you’re very smart! My dad worked for wildcatters, started out as a roughneck, then driller, then a toolpusher. Fuel is important work. Thank you. That’s very kind of you! I just checked out your blog, and we have a lot in common. Never underestimate a Southerner, right? Gorgeous work 🙂 I have seen pencil sketches but never oil sketches. Thank you for the introduction. Looked at your blog – very sensitive writing style – I didn’t feel exfoliated after looking at it. Intrigued by the randomness, and I love shoes, too. I think the proper response to that would be KOWABUNGA. I’m quite interested in Coffee, so when I am old enough, I am actually thinking of being an amateur cupper. I looked at your blog, and learned a lot about Korea that I didn’t know. People standing in 20 degrees below 0 weather to celebrate the New Year – now, that’s brave! So, it looks as if Gwanghwahun is the Times Square of Seoul, huh? I would really like to see the Boshingak Temple. If you post that coffee journal on your blog, we can have a look at it. I am mildly obsessed with your blog, it’s so clever and your painting ability is so evident. Excellent work. Thanks for sharing your point of view. Just looked at your blog, and I love your first post. I have no intention of seeing Avatar, but I didn’t see Titanic, either. Even so, I loved your post about flesh and blood characters, and true romance, and your writing just sung! What a gift you have. What a blessing. I try and keep things simple. Everything you ever wanted to know is found in the Nicene Creed. Absolutely fabulous … you caught the intensity and sheer concentration. I know someone like this .. and you caught the essence … two thumbs up! Love this. Cait, if I could hit the “Approve” button twice, I would. My daughter and her college friends would love to have so many of those great retro outfits – I love that pencil sailor skirt! I wish you the best in your endeavors – you are so talented. Many people need to know about you. You are a gem. Thanks so much for the nice words … I’m adding your blog to my list … it’s a keeper : ) Keep up the good work! I just sent you blog link to me daughter, to see if she wants to buy a dress. I really like that little blue, sailor-inspired dress. I see that you are from Indonesia. I read an article in the Wall Street Journal recently about your President. It seems that he is very progressive in his thinking when it comes to the economy and technology of Indonesia. I wish you the best in all your worthy endeavors. This is lovely. Painting is my other love; unfortunately, I don’t paint as well as I read. Your guerilla style of painting and your insight into human behaviours is inspiring. Keep painting! I just love your book criticism blog over at jesscreadsbooks.wordpress.com. I found myself spending more time than I have reading your reviews. You are great!Funny!Concise! ps:please expand the BookFail Dept – what a hoot. Haha thanks Lavanna. I’ll keep working on debunking the theory that book lovers will read anything – I’ve still got a few BookFails under my belt. And I must admit, I am painfully jealous of your artistry with paint. Do really do paint wonderfully. How long have you been painting for? I’m so glad I found this blog! The description really gave the painting so much more life! I love the “Focus” post. I would love to have someone help me with staying focused, not obsessed, and staying organized. Just loved the idea of you blog. Must FAV it, your work is soooo inspiring!